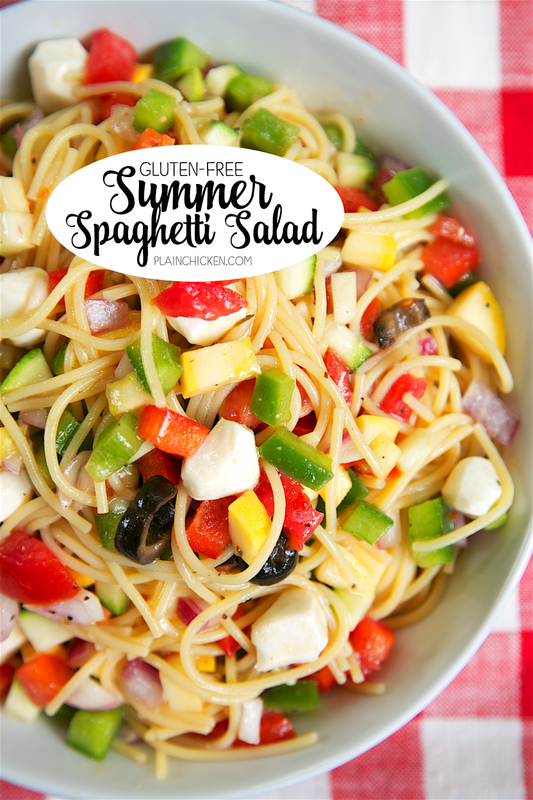 Gluten-Free Summer Spaghetti Salad - nobody will ever know this is gluten-free! Made this for a potluck and everyone raved about it! Pasta salad loaded with squash, zucchini, red bell pepper, green bell pepper, red onion, tomatoes, olives, and mozzarella - all tossed in Italian dressing - SO good! Summer cookouts are my favorite thing about summertime. I just love to have people over and fire up the grill. We had a cookout a few weeks ago, and one of my friends has celiac disease. I knew I needed to plan a few dishes that were gluten-free so she could enjoy the meal. I didn’t want to single her out, so I wanted to make dishes that were gluten-free that everyone would enjoy. I made some chicken marinated in a gluten-free marinade. 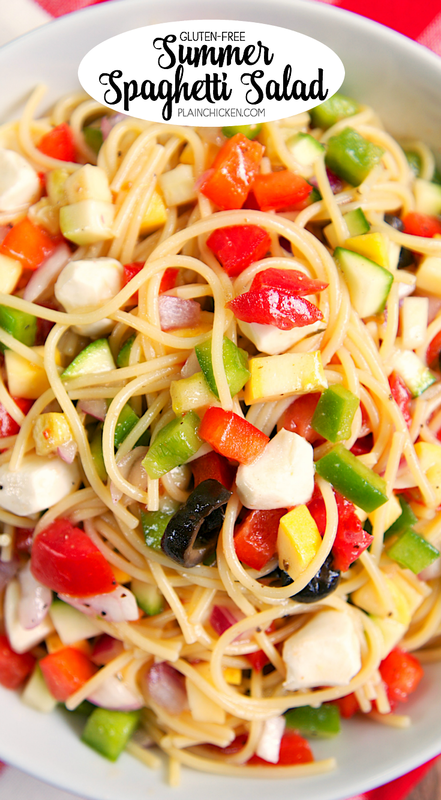 For one of the side dishes, I made this Gluten-Free Summer Spaghetti Salad. It was CRAZY good! Tons of fresh summer vegetables, mozzarella cheese and gluten free pasta tossed in Italian dressing. Super easy to make and it tasted fantastic. I used Ronzoni Gluten Free® pasta in this dish. It is made with white rice, brown rice, corn and quinoa. I was really surprised. It actually tasted great! It really did taste just like regular white pasta. 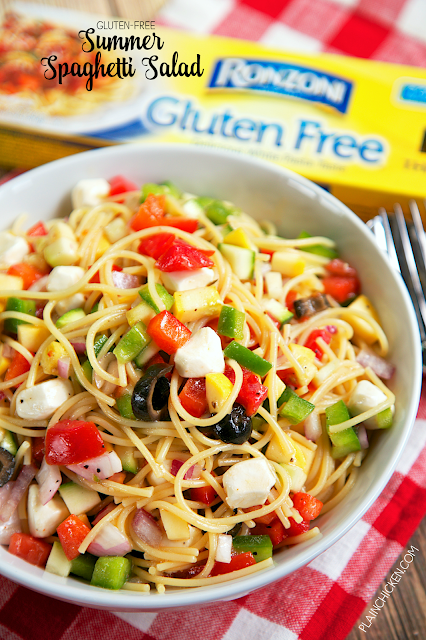 I served the pasta in this Gluten-Free Summer Spaghetti Salad at the cookout and no one could believe it was gluten-free. Everyone raved about it. There were no leftovers and everyone asked for the recipe. Who knew cooking gluten-free could be so easy and delicious?!?! Cook thin spaghetti according to package directions, then drain and rinse in warm water. Place tomatoes, zucchini, squash, peppers, onion, olives, and cheese in a large bowl. Add cooked thin spaghetti noodles and mix well. I love pasta salad with tuna and black olives that my mother makes. I love my Pasta shells with no cook tomato sauce with peppers and basil. We love Italian pasta salad with pepperoni, tomatoes, olives and mozzarella. My favorite summertime pasta dish is Pasta Salad. I love maccaroni salad. The old fashioned kind with all the mayo. I like shrimp, tomatoes and feta in a pasta salad. Grilled asparagus and zucchini pasta is my favorite summertime pasta dish. My favorite summer time pasta dish is fresh cherry tomatoes, garlic, a touch of olive oil and fresh basil served over angel hair pasta. I have a recipe for Avocado Pasta Salad that we all love. It uses rotoni pasta. I love pasta salad with olives, artichokes, other vegetables, olive oil, and vinegar. I love an itail dressing salad with pepperoni, salami, cheese, tomatoes,and black olives. I like to make pasta salad using sliced/chopped roasted red peppers, fresh basis, ground peppers, balsamic vinegar and olive oil. Thanks so much. I love a classic pasta salad with colored pasta. Basil Chicken Pesto. So yummy! My favorite Summer pasta dish is macaroni salad. I love a great pasta salad with fresh tomatoes, carrots, and parmesean cheese. I love pasta salad during the summer months: cold, and yummy, and you can add anything you want to it for variety. Salami and olives is great in pasta salad. My favorite summertime pasta dish is a simple pasta salad mixed with italian salad dressing, peppers, onions, tomatoes, and parmesan cheese. My favorite is Bacon Ranch Pasta Salad. We like penne pasta with avocado, tomato, lemon jice, and fresh herbs. so good! I love Italian pasta salad in the summer. my favorite summertime pasta salad is macaroni salad! My favorite summertime pasta dish is Penne noodles with cherry tomatoes, fresh mozzarella and chopped basil. I posted a tweet: https://twitter.com/FireRunner2379/status/760584890626740224. I like a pasta salad with lots of veggies and Italian dressing. 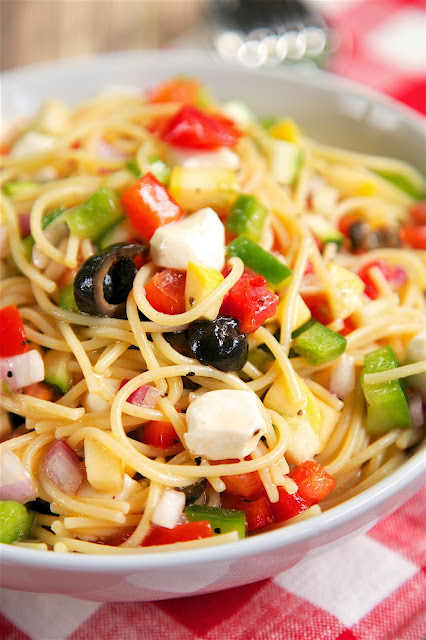 We love Italian pasta salad with bacon, onions, tomatoes, olives and mozzarella cheese. In summer I make a greek pasta salad with green onions, kalamata olives, cherry tomatoes, feta and an olive oil, wine vinegar and oregano dressing. Pasta salad with fresh veggies. I love orzo with artichokes, tune, capers and parsley. My favorite summertime pasta dish is a cold salad using small pasta shapes (mini rotini or bow ties are great) with diced fresh vegetables, chick peas, and a light herbed vinaigrette dressing. Pasta salad with broccoli and peppers. I like to make Cheaters Fake Chinese Peanut Noodle (good warm or cold) which is spaghetti pasta, unsalted peanut butter, low-salt soy sauce, some stray chopped peanuts, hot sesame oil, red pepper flakes & salt. Nice with cucumbers on the side when you eat it cold. Macaroni and cheese is always a good pasta in the summertime. summertime? just what this recipe is about... speghetti salad!!! yummm. I like your recipe. I enjoy rotini pasta dishes. My fav summertime pasta dish is linguine tossed with EVOO, fresh basil from my garden, and freshly grated Parmigiano-Reggiano on top. I love a delicious Italian pasta salad in the summer. My favorite summertime pasta dish is a cold pasta salad made with veggies and beans. I love a good cold tortellini salad with monterey jack cheese and broccoli mixed in. 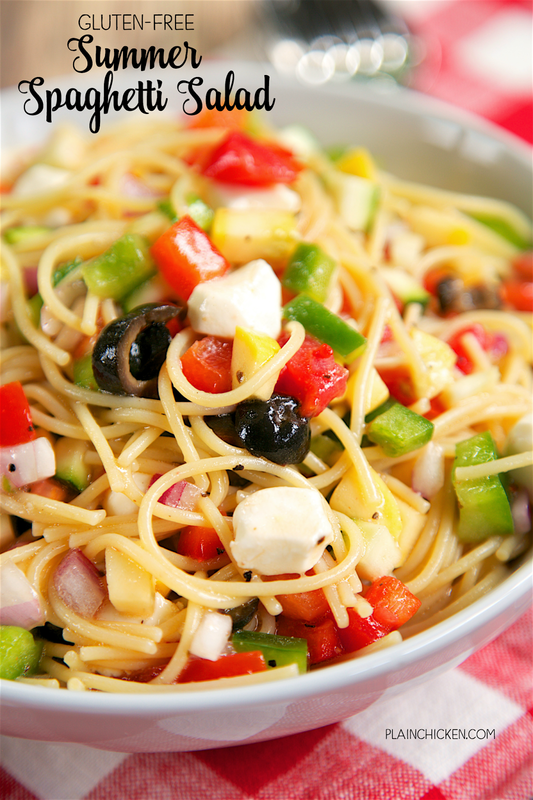 My favorite is spaghetti salad because it is so versatile. It's good warm or cold and I can use different ingredients every time I make it. My favorite summertime pasta dish is a Potato Salad with yellow mustard mixed in with it.